Art by Jack Coggins. This image appeared in "The Art of Space" (Zenith Press, 2014). Zenith Press contributed these images to Space.com's Expert Voices: Op-Ed & Insights. Ron Miller's astronomical art has appeared in Hollywood blockbusters, magazines and museums, and he has authored more than 50 books. In his latest, "The Art of Space: The History of Space Art, from the Earliest Visions to the Graphics of the Modern Era," (Zenith Press, 2014) Miller highlights the work of dozens of artists who have shaped public perceptions of space over centuries. The book presents over 350 images, and in the exclusive Space.com gallery, we feature 12 of them. For more, read Miller's exclusive Space.com essay, "The Art of Space, Envisioning the Universe (Op-Ed)" and read and excerpt of the book here. (C) John Berkey; Not for reproduction without permision from the artist. After creating the covers for Ballantine Books' STAR series in the 1970s, John Berkey's work was in great demand for science-fiction book covers. This painting, End of the Run, is typical of the work he did. Berkey was eventually inducted into the Society of Illustrators' Hall of Fame, where he was called the most influential and innovative futurist artist of his time. This image appeared in "The Art of Space" (Zenith Press, 2014). "Is anyone out there?" asks the lunar explorer in this 2004 painting. This work is by American astronaut-artist Alan Bean, who walked on the moon as part of the Apollo 12 team. (C) Pat Rawlings; Not for reproduction without permision from the artist. Pat Rawlings illustrates the idea of automatic "hab-bots" that might be sent to Mars ahead of human explorers. These systems would include individual mobile-habitat modules that interlock, creating a ready-made, fully functional habitation awaiting the eventual arrival of the astronauts. This image appeared in "The Art of Space" (Zenith Press, 2014). (C) Michelle Rouch; Not for reproduction without permision from the artist. Michelle Rouch turns the splashdown of an Apollo Command Module into a near-abstract design. A fine artist with a master's degree in engineering, Rouch has not just a special appreciation of the technology of space flight, but also the ability to depict it with skill and imagination. This image appeared in "The Art of Space" (Zenith Press, 2014). (C) Marilynn Flynn; Not for reproduction without permision from the artist. In Shamshu Sojourn, a painting created in 2011, Marilynn Flynn depicts a pair of astronauts exploring the Shamshu region of Jupiter's volcanic moon Io. The scene was inspired by a visit to the "Devil's Kitchen" area near Greybull, Wyoming, a geologic oddity that appeared as the alien planet Klendathu in the 1997 film Starship Troopers. This image appeared in "The Art of Space" (Zenith Press, 2014). (C) Lynette Cook; Not for reproduction without permision from the artist. Growing Planets is one of a series of surrealistic paintings by Lynette Cook that bring to mind the work of René Magritte. Here she not only plays upon the evolutionary process by which our solar system was created — she indulges in a nice pun as well. This image appeared in "The Art of Space" (Zenith Press, 2014). (C) Lucy West; Not for reproduction without permision from the artist. This work by Lucy West was inspired by M42, the Great Nebula in Orion, one of the most beautiful sights in the night sky. Although the Great Nebula is easily visible through even a small telescope, it took the Hubble Space Telescope to reveal its full grandeur. This image appeared in "The Art of Space" (Zenith Press, 2014). In Origins, artist Lucy West explores the origins of life. "Since humanity first stepped out of the African savannas," she explains, "we have searched to understand our place and purpose in our world and universe." In this painting, shadowy figures march across a bridge from the sun to the earth — an evocative reminder that human DNA, and thus all human life itself, is essentially recycled star-stuff. This image appeared in "The Art of Space" (Zenith Press, 2014). (C) Kara Szathmáry; Not for reproduction without permision from the artist. Canadian Kara Szathmáry is an astrophysicist and mathematician who has found expression for his ideas in art. Rather than attempting to depict concepts of physics and math literally, he experiments with interpreting quantum cosmology events using various collage materials and paint. This image appeared in "The Art of Space" (Zenith Press, 2014). 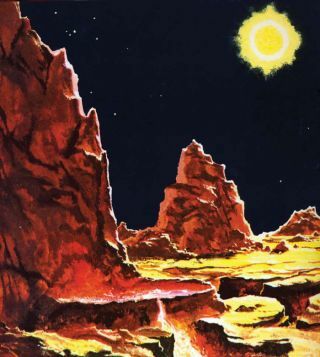 (C) David A. Hardy; Not for reproduction without permision from the artist. Harking back to the hollowed-out asteroids of Frank R. Paul and James Cutter, David Hardy takes the idea to a new level. Instead of just providing a habitat, the asteroid is an interstellar spacecraft. Here we see it, light-years from home, having arrived finally at a distant, earthlike world. This image appeared in "The Art of Space" (Zenith Press, 2014).